Last night, a couple friends and I went to the Variety Playhouse to see Stuff You Should Know recorded in front of a live audience. The event was general seating, and on our way in the door, the girl in front of us in line fainted, and one of my friends ended up being the one to call an ambulance. I'm glad we helped a sister out, but I'm sad to say this meant we had to sit way in the back, and the above photo (taken by my friend Aly) was the best we could do for imagery. 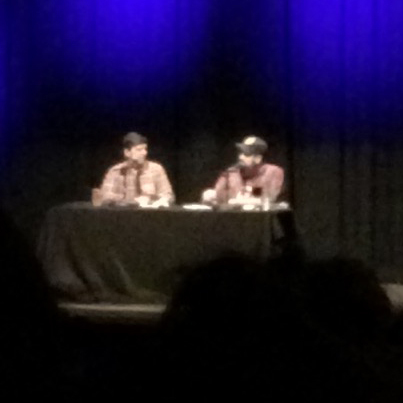 The show started with a little bit of standup from the two of them - a relaxed back and forth about whatever was going on in their lives and on their tour. This set them up for several jokes later in the podcast which I was sad to think they had said to a bunch of other audiences. Still, they were pretty funny. Now, when listening to the podcast, it's obviously been edited down from its original recording because there's a lot more chit-chat between the two hosts than you hear on a recording. Finally, though, they did get to the main topic of discussion for the night, and it was a good one. The topic for this podcast was D.B. Cooper. Within the first sentence, one of my friends knew what the subject would be, and she was pumped. If you're unfamiliar with the story, it's basically an unsolved hijacking in which no one is sure if the culprit survived or made off with any of his money. Chuck and Josh's telling of this tale was entertaining if a little drawn out. I find myself wishing at some times that they would stop messing around and get to the point. However, that did not detract from the many laugh-out-loud moments in the presentation. Stuff You Should Know's podcast on D.B. Cooper will supposedly air at some later date, and when it does, you should listen. It is a pretty cool story. Now, though, I really need to know who D.B. Cooper was and what happened to him. Chuck? Josh? Please. Figure it out. Thank you.